Locals form the foundation of the union. The Local is where members connect to the union -- it's where they go for help, where they meet to discuss workplace concerns, where they elect their representatives and where they vote on proposed contract settlements. Locals may form a component. Components bring together members who work for the same government department, agency or territorial government. Locals that are not part of a Component are known as Directly Chartered Locals. These locals are structured to meet the specific needs of their sector or workplace. 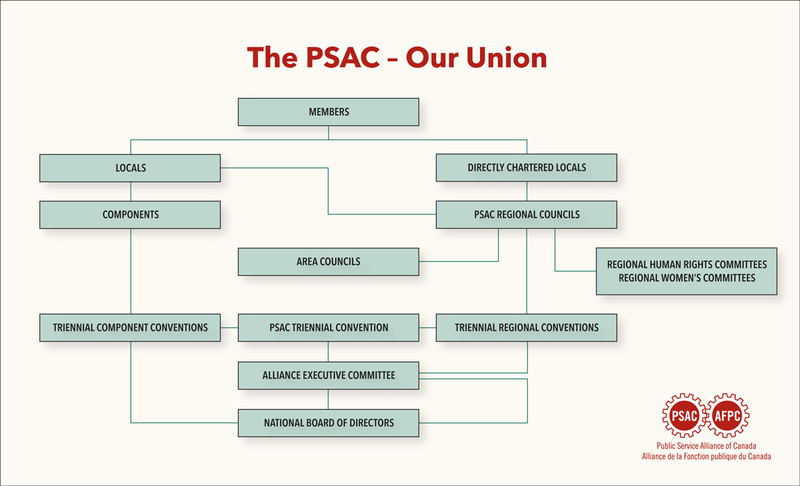 In addition to the component structure, the PSAC is organized along regional lines. There are seven regions - Atlantic, Quebec, National Capital Region, Ontario, Prairies, British Columbia, and the North. Across the regions, staff from the 23 regional offices provide expertise and support to Local officers and members. The PSAC is connected to the larger Canadian labour movement through our affiliation to the Canadian Labour Congress and by local affiliations to the provincial and territorial federations of labour and to district labour councils. On the international level, the PSAC is part of Public Services International, which serves as a link to other public service unions around the world. 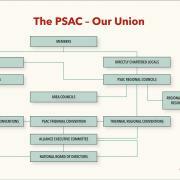 The PSAC National Triennial Convention is the union's supreme governing body. It is the highlight of the democratic process within the union. Delegates to the convention are elected at their respective component conventions, by area councils and by Directly Chartered Locals (DCLs) with more than 100 members – or by groups of DCLS that add up to more than 100 members. In addition, each PSAC equity group represented on the PSAC Equal Opportunities Committee is entitled to send two delegates to the convention. The convention is the forum where members vote to adopt policies that direct how the union will spend its money and what priorities it should pursue until the next convention. Convention delegates also elect the National President, the National Executive Vice-President and the Alternate National Vice-President. In between the National Triennial Conventions, the seven PSAC regions each hold a Regional Convention. Each Regional Convention is responsible for electing its respective Regional Executive Vice-President (REVP) and Alternate REVP. The Regional Conventions may also adopt resolutions for referral to the National Convention. The National Board of Directors (NBoD) serves as steward of the PSAC between conventions. Made up of the Alliance Executive Committee (AEC), along with the presidents of the 15 components, the NBoD meets three times a year and as needed in order to render major program and policy decisions. The National President, the National Executive Vice-President and the seven Regional Executive Vice-Presidents form the Alliance Executive Committee (AEC). The AEC is responsible for the day-to-day decisions of the union with respect to finances, overseeing campaigns, mobilizing the membership, advocating on behalf of the membership and advancing the union and its members' rights in the workplace. The AEC meets monthly and as needed.